There are so many reasons why Legends Giant Mals is several steps above and far beyond many other breeders. We are not claiming to be the best. After all, is anyone really the best? Being the best is purely dependant upon what a particular person is looking for. The purpose of this page is NOT to breeder bash but to simply educate prospective puppy families who are looking to add a great new family member to their home. Many people do not know what to look for when looking for a new puppy or a reputable breeder and simply fall victim to cute puppy pictures and fast talking breeders looking to move their "product". We cannot tell you how many times we have talked to people and given them information and received the response of "wow I never thought of that". This is not just indicative with Giant Alaskan Malamute breeders but is applicable to breeders of all dog breeds. However, there has never been more drama and deception in our experience then there is in the Giant Alaskan Malamute world. There is one thing that is a fact among "most" Giant Alaskan Malamute breeders: We've all seen it. Everyone claims they have the biggest dogs out there. What's the truth? Based on our own experience, we are stunned at the size and weights most breeders claim that their dogs and pups are. At times it is even quite comical. We have been left so many times really wondering have these breeders "actually" seen a real Giant Alaskan Malamute before? The truth is that most breeders are "pop up" breeders without much knowledge of the breed and others are simply inflating weights to sell their pups. The lack of knowledge with pop up breeders and even those that have been around for some time breaks down into several aspects that go far beyond "size". → Most breeders will sell their dogs to anyone who is willing to pay for them. The puppies are viewed as a product, pure and simple. That fact is apparent by being able to buy a puppy through email or a quick phone conversation. The breeders have no real "care and regard" for where their puppies are going. Again the puppies are a product and the goal is to move that product. ♥ Why is Legends Giant Mals different then this? We do NOT view our puppies as a product. They are living beings that we are responsible for bringing into this world. We are responsible for the lives that we have brought into this world. We CARE where are puppies are placed. We do NOT sell our puppies by email or by a quick phone conversation. We require an adoption application, we require knowledge of the home and family where the life we created will live. → Most breeder's dogs spend their lives living in kennel facilities with no other purpose then to produce puppies to sell. Gotta get that "product" produced. How sad to know that a dog's life is spent living in a kennel with the only human interaction received being at feeding time and kennel cleaning time. Our dogs live in our home!! They do not live in a kennel and they receive human love and interaction all of the time. They are our family members not "product producers". → Several breeders own an enormous amount of dogs and output an enormous amount of puppies on a constant basis. Now let's think about this logically. Some breeders have puppies born every month. Every month litters of puppies. Let's say a breeder owns 20 dogs, as addressed above we already know they are out living in a kennel. Now let's say this breeder produces 5-6 or more at a time. Now we are looking at a breeder who has 20 adult dogs and a minimum generally of 42 puppies. Now again let's think about this logically...that is 62 dogs!! 42 of which are puppies. Do you really think that 42 puppies can be properly cared for and socialized? Do you really think that 42 puppies are living in the house or in the kennels outside? The only time those kennel puppies ever see the inside of the house is maybe for a bath before "pretty" pictures are taken to put up to get them sold. Our puppies are born in our house and live in our house. NEVER in a kennel facility. We only have a few litters a year. Coming straight from the mouth of a breeder........Puppies are a CRAZY amount of work. The first 2 weeks are spent sleeping in our living room next to the mother(s) and puppies to check on them constantly to make sure everyone is ok. I can't express how many times that devoted care and attention has saved a puppy's life who has squeezed in behind mom and could not get out. Our pups are always kept in complete sanitary conditions are not left filthy until "pretty" picture day. Our puppies are properly cared for around the clock. Also see our Why Legends page for pictures. → Most breeder's sales take place that involve shipping of the puppy. No people coming to their "facilities" to actually see the living conditions or to actually meet the dogs that are "claimed" to be so huge. Puppy families just believe what the breeder tells them. They believe the deceiving pictures and they believe the completely outright lying dog sizes. With no one coming to your "facility" you can claim your dogs are as big as you want and people just believe it. It always amazes me. I know the picture tricks and I have gotten pretty accurate at judging the true size and weight of a dog based on picture alone. Most of the "Giants" out there are no where near the size that the breeder is claiming they are. There are some real scummy breeders out there who "portray" themselves as reputable and caring but they are some of the biggest liars and con artists out there. Gotta love the breeders who claim their dogs are so huge yet you never see them with a human in the picture for comparison but "to the trained eye" you can see the fence next to them and get a perfect idea of the dogs size based on the fence height. Just as an example please view the picture below. 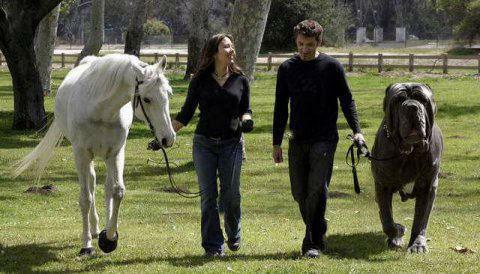 The dog in the picture is around the size that most Giant Alaskan Malamute breeders claim their dogs are. That's what we find comical yet at the same time we feel so bad for the families that spend so much money on a puppy they expect to get so large. Of course they love their puppy and may feel disappointment when the dog is full grown and it is no where near the size the breeder told them it would be but they already love their dog so size and disappointment fade away. 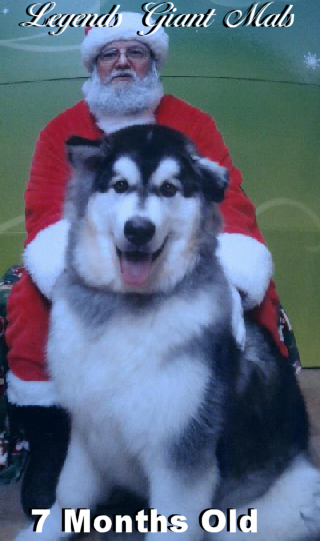 Again look at this picture...haha I'd love to meet a Giant Alaskan Malamute this size. Owner of this image is unknown. If you are the owner or know the owner please let us know. We sell most of our puppies locally. We prefer that. While we do ship, we love to meet people in person. We love for people to meet us and our dogs. We love for people to know that we are not one of the scummy breeders who lie and view their puppies as products. We want people to know how very much our dogs and puppies are loved. We want people to know our dogs are truly the size and weights we say and we do not need to lie and deceive. Do we think all of our dogs are the biggest? Nope!! Do we think our lines produce some of the biggest puppies and dogs out there?? Absolutely!! The proof is in our offspring. Positively HUGE!! Legends Giant Mals focuses on selective breedings that produce some of the most healthy, gentle tempered, perfectly marked, and absolutely HUGE dogs available and we stand behind our statements and can prove it. 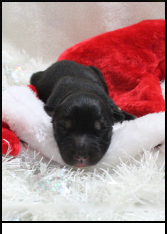 Just check out the picture below of one of our pups from our breedings. → Most breeders try to solicit testimonials from puppy families because they barely receive them or they simply make up their own. We never do this. Just read through our Facebook page of the posts from our very happy puppy families that were not solicited. If you have to solicit a testimonial from someone or make up your own how satisfied are your puppy families? Obviously not very! → Little to no knowledge about the breed (the history, the standards, the inability to define coat colors and coat types properly ex: defining a seal & white puppy with a long coat as a black & white wooly coat). → When asked why are they breeding will typically respond "to better the breed". When asked what are they specifically doing to "better the breed" don't really have a logical or knowledgeable answer and will stammer and circle talk around the question. → Sells puppies to anyone who is willing to pay and even will arrange "Lay-a-way Plans". Has no interest in screening potential homes. Has no interest in keeping updated on the puppies they produce or following their genetic lines. → Tries to avoid allowing you to come to their premises (has numerous excuses of why you can't). → Breeds their dogs when they are very young (before an acceptable breeding age that would produce sound and healthy puppies) - typical reasoning given is that it was an accidental breeding (responsible breeders do not have accidental breedings). → Keeps their dogs confined to a kennel life with no purpose other then producing puppies. → Will ship or allow puppies to leave their premises before 8 weeks of age (unhealthy to the critical develop of a puppy) - the sooner they can dump off the puppy on the new owner the less time and expense they need to invest. → Offers AKC registerable puppies at a highly discounted rate "without" papers. → Dodges questions or fast talks around them leaving you wondering after the conversation if your question was even answered. → Sells full registration/breeding rights to anyone who is willing to pay extra cash for them (even when they claim they rarely do). Try to get full registration/breeding rights from a breeder and see if you can. It's a sure tell tale sign of an un-reputable breeder just looking for more money. → Produces more then two breeds of puppies. Sure sign of someone focused more on money rather then focusing on a particular breed with a set of goals and ethics. → Breed a litter because "someone requested a puppy"... self explanatory, I mean seriously??? → Always has puppies available for sale and is always expecting another litter. Sure sign again of a breeder focused on dollar signs and not breeding with a set of goals or ethics. → Offers puppies "On Sale" for a certain time to try or encourages puppies as gifts especially around big holidays like Christmas. Puppies should NEVER be given or purchased as a gift!! Directly after Christmas shelters are overpopulated with puppies turned into shelters that were given as gifts that the receiver did not want.